The Nabha Court has sent Khalistan Liberation Force terrorist Harminder Singh Mintoo to Punjab Police remand till December 20. AMRITSAR: The Nabha Court has sent Khalistan Liberation Force terrorist Harminder Singh Mintoo to Punjab Police remand till December 20. He further said that Harjot was the conspirator of the case and had also given shelter to Chanpreet. “When they got to know that one of their associates has been arrested in Uttar Pradesh, they ran away to Delhi from the place they were hiding...where they were provided logistic support by Ranjeet Singh. They had robbed two and a half kgs gold and Rs.10 lakh cash from a businessman’s house in the month of September in Model Town of Ludhiana and the money was used to purchase weapons,” he added. Earlier, Mintoo was sent to judicial custody till December 14 by the Patiala House Court. 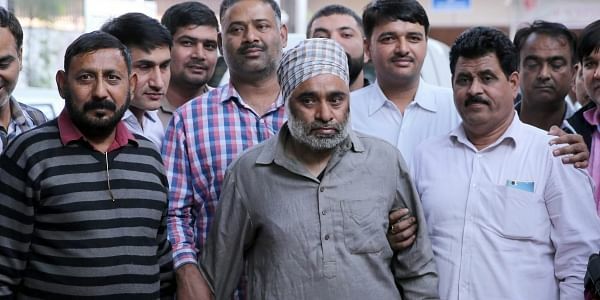 The court has also decided to consider the Punjab court's plea seeking the transit remand of Mintoo on December 14., was nabbed on November 28 from New Delhi railway station, a day after he escaped with five other inmates from Punjab's Nabha Jail. During his interrogation, the self-styled KLF chief had reportedly told interrogators about expansion plans of the KLF through Pakistan's Inter-Services Intelligence. Days before the Nabha jailbreak, he had his last Skype chat with his Pakistan handler Harmeet, a KLF militant who managed to flee to Pakistan, and is living in a safe house under the protection of the ISI at Dera Chall village in Lahore. The ISI had plans to bring militancy in Punjab through the KLF under Mintoo's leadership, said sources. Mintoo has bases in countries like Cambodia, Laos, Myanmar and Thailand and ISI had plans to bring back militancy through these sleepers said sources, adding that Mintoo made these contacts during 2009-14. Germany-based KLF sympathisers were sending money to Mintoo through Western Union Money Transfer. On the day of jailbreak, lakhs of rupees were deposited in a bank account, which was supposed to be handed over to Mintoo by Shagun Sweets owner, who was arrested by the Punjab Police, but Mintoo managed to flee, so he couldn't get the money, said sources. Also, a KLF sympathiser, Sandeep, who is based in England, has also sent him money through Hawala channel. He was staying in Malaysia with a fake passport in the name of Bakshish Singh. "Harminder has accepted of being a Mastermind of the jailbreak. Six months back, he first contacted an inmate Gurpreet Singh Sekhon, who later contacted Vicky to arrange his local criminals to wait for the day suitable for the attack. Parminder being close to Satnam Kaur, Daughter of KLF militant, was given responsibility to arrange the arms. The Punjab police are probing arms trail with the assistance of UP police," said sources. "Mintoo has revealed of having a strong base in Goa. His family shifted to Goa in 1989 and raids are being carried out in Punjab to look for Satnam Kaur. Police teams will also be going to Goa to look for Mintoo's aide," sources added.